Greenpeace and the other ENGOs involved in the agreement have chosen their words carefully. Greenpeace has called the deal an “unprecedented accord...covering more than 72 million hectares of public forests, an area twice the size of Germany.” The agreement includes what the proponents are calling a series of interim measures to protect caribou habitat while various levels of government take action to create protected areas for caribou. 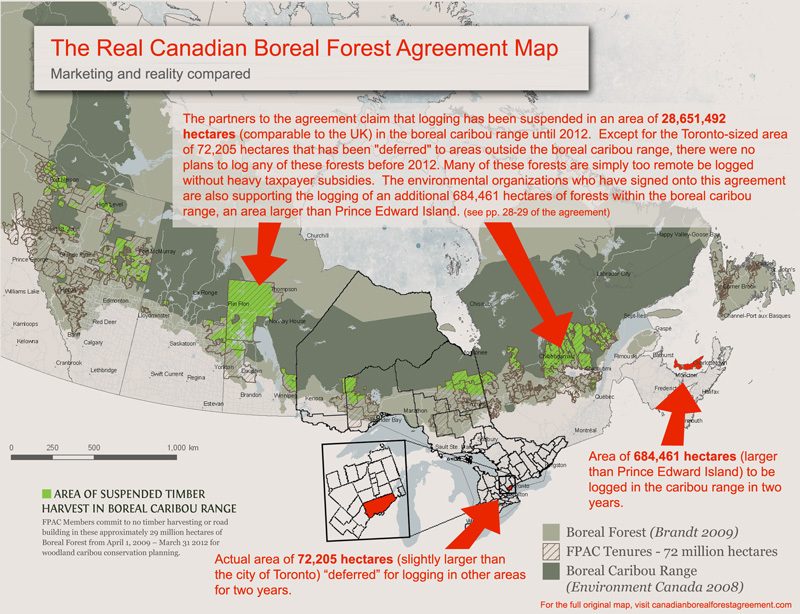 While the agreement technically "covers" a forest twice the size of Germany, the amount of caribou range that will not be cut before 2012 as a result of the agreement is only slightly larger than the City of Toronto. Submitted by Alley Katz (not verified) on Thu, 2010-05-27 11:23. So much for the 'historic' agreement between the forest industry and the ENGOs. My take on the situation: This is the same kind of behaviour we see among many other advocacy groups on many diverse arenas of struggle in Canada. The advocacy groups receive money from large foundations and private donors who want to see 'tangible results' for giving them money. Subsequently these organizations enter into these kinds of public charades to give an illusion that they are being effective with the financial contributions. Claims of ‘effectiveness’ are then presented as justifications for why they should continue to receive more money because of their 'results.’ Also these groups become ‘infested’ with people who are right wing social democrats and liberals thereby creating an environment where more progressive minded individuals experience hostility to their more radical approach. This is obvious to most people anyway but just thought to post a reminder to consider for the next time someone thinks about where to make a financial contribution. Submitted by kjikaqawej on Thu, 2010-05-27 14:31.
purdy good analysis there Alley Katz. Also comes down to personal and group/organisational integrity, honesty with one/itself and others. Instead of making the donors play by its rules, they play by the donors' rules, losing integrity and legitimacy in the process. Submitted by Ivan Doumenc (not verified) on Thu, 2010-05-27 23:37. Submitted by dawn on Fri, 2010-05-28 20:36.
yea, that's the same one I had access to while writing this piece (as posted on VMC). Detailed maps are still missing. Submitted by Carol Overland (not verified) on Tue, 2010-11-09 14:21. Thanks for the agreement, helps to have the primary documents. Submitted by priscilla judd (not verified) on Tue, 2010-06-01 00:48. Great writing Dawn, thank you very much. That belief will not protect nature! It creates thousands of miles of clear cut barren wastelands for “environment friendly” export 2×4’s, for the next three years while the NGOs sit in an office protecting “caribou” on maps and diagrams with circles and arrows and paragraphs that explain the necessary amount of light for moss production to keep x number of caribou from landing on the red list for extinction. Submitted by salmonguy on Tue, 2010-06-01 13:26. Will be posting some more thoughts on the agreement as i wade through it. Submitted by dawn on Mon, 2010-06-07 17:25.
really enjoyed reading it. Have you given this a listen yet? Submitted by Anonymous (not verified) on Thu, 2010-06-17 10:28.
your article is garbage. You have still not interviewed anyone who is part of the agreement directly. That's not very good journalism and this reads like an opinion piece though you are described as "Dawn Paley is a Vancouver-based journalist and a member of the Vancouver Media Co-op." If an organization chooses to stop criticizing or protesting a company that's their chose. If you are a financial supporter of that organization you have the right to stop donating. Maybe Greenpeace should be saying that dawn, salmon guy, ivan, etc. are not doing anything and thus are sell-outs to companies. They don't because it does not really matter - you're all independent. If you chose to protest - that's your right - if you chose not to, that's your right as well. Public infighting in the movement doesn't really help anyone. Take your blogging energy and set up a markets campaign, or organize a protest, or at least write a letter to some decisionmaker. Or just sit at your computer and continue to not do anything. Submitted by dawn on Wed, 2010-06-23 18:28. I interviewed Steve Kallick who was part of the agreement directly. You can see that interview included in another story I did, which is linked to in this piece. Set up a market protest or write a letter? BWA HAHAHA. Good one anonymous keyboard warrior. Hilarious. Did Paley even read the CBFA? Submitted by ASR on Sun, 2010-08-15 19:23. This article is absolutely awful; it’s grossly misleading, and contains several false and/or confused statements about the contents of the CBFA. Some of the statements are so obviously false to anyone who’s actually read the deal that I find it hard to escape the conclusion that either the author didn’t read the whole deal, or she decided to suppress those parts which she found inconvenient. The most charitable interpretation I have been able to come up with is that the author got over-excited about having a juicy scoop when she obtained her leaked copy of the agreement, and, overzealous in her desire to write a hard-hitting expose trashing the deal, simply didn't read the agreement carefully, or even fully, and interpreted what she did read through the lens of the story she wanted to tell, and so saw primarily what she wanted to see. 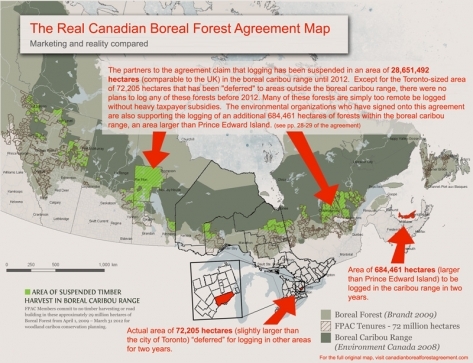 The most glaringly false statements in the article are the claims that the CBFA basically consisted of the following trade between environmental groups (ENGOs) and logging companies (FPAC members): FPAC members agreed to defer logging in 72205 hectares of caribou habitat until March 31, 2012, and in exchange the ENGOs help market FPAC members as 'green'. 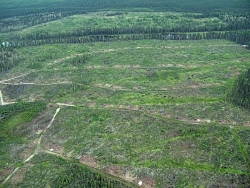 Paley makes this claim when she writes that "this agreement aims to silence all criticism of logging practices in the boreal forest in return for less than two years of diverting harvesting and road building from 72,205 hectares of woodland caribou habitat into other areas of the boreal forest." And then again: "In return for swapping 72,205 hectares of harvesting out of the boreal forest and maintaining ‘voluntary deferrals’ for another two years, the CBFA transforms the nine ENGOs involved into a promotional service, protection racket and intelligence gathering service for twenty one companies that are actively logging woodland caribou habitat within the boreal forest." The CBFA sets up a framework and a foundation for signatories to collaborate in the management of logging and other forest sector activities within the boreal tenures of the companies who've sign it. It outlines six 'Goals' (a better term for them would be commitments) and sketches out how signatories will achieve them and on what time frame. The Goals are: 1) companies implement Ecosystem Based Management (EBM) in the areas they log; 2) implement and advocate for a network of protected areas within the boreal; 3) develop and implement recovery plans for species at risk, especially caribou (this is where the deferrals come in); 4) position forest products within the larger effort to tackle climate change; 5) some general priorities for prosperity in the forest sector; 6) environmental groups work to help brand companies as 'green'. Obviously this summary glosses over and leaves out a lot, but it gives the basic gist of the deal. If anyone wants to read the goals in detail they're described in Schedule A. But the basic point is that if the CBFA consists of a trade then it consists of ENGOs giving Goal 6 and FPAC members giving Goals 1, 2, and 3 (goals 4 and 5 don't seem to clearly be a 'concession' for either side). However, this article would have you believing that Goals 1 and 2 don't exist, despite the fact that they have 6 pages (18-23) devoted to them, and that Goal 3 (pages 24-28) consists entirely of the deferrals, which it does not. Did Paley simply not read pages 18-28? Perhaps she thought Goals 1 and 2 and most of 3 were so meaningless that they might as well not be in the agreement; but if so then she must provide some sort of explanation or argument for why this is the case (e.g. explain why EBM, protected areas and recovery plans are worthless, or why there's no reason to think EBM, protected areas and recovery plans would actually be implemented), rather than simply suppressing the fact of their existence. Paley also confuses the expiry date of the deferrals with the expiry date of the agreement, incorrectly claiming that the agreement expires when the deferrals do (though, admittedly, this is an understandable error for somebody who apparently thinks the agreement consists solely of the deferrals and Goal 6). She refers to "the spring of 2012, when the current agreement expires," and then later on she refers to the CBFA as a "‘three year’ deal" (the deferrals expire in the spring of 2012). From these statements I can only conclude that Paley either didn't read or simply forgot about Section 44 of the agreement, which states that the CBFA "will continue in effect until full implementation of all elements of Schedule ‘A’... unless terminated sooner by mutual written agreement of the parties." That is, the CBFA doesn't expire until it's been fully implemented, unless the signatories all agree to end it sooner. Thus the agreement expires not when a particular date arrives, but rather when certain conditions are met. Overall, the deal described in this article bears only a superficial resemblance to the actual CBFA. I apologize if I’ve been overly harsh in my comments, but I really don’t appreciate being mislead, and that’s exactly how I felt when I actually went and read the CBFA after reading this article. Submitted by dawn on Tue, 2010-08-17 16:04. I did read the CBFA, from beginning to end. I'm glad that you went and read the agreement, my point with the article is to distinguish the spin ("saving a forest the size of Germany") from what the agreement actually says. Through the spin, we've been extremely misled about the contents of this agreement. Can you give an example of EBM has led to anything except self-regulation by a logging company? Also do you have an official affiliation with Greenpeace? Just wondering. Submitted by ASR on Thu, 2010-08-19 23:43. But how could you possibly think that the way “to distinguish the spin… from what the agreement actually says” was to lie about what the agreement actually says!? The mistake about when the CBFA expires I can understand; Section 44 is three little lines in a long, dense document. You should have caught it, but it’s understandable that you didn’t. But I really have trouble grasping how you could have read the agreement and completely missed the 11 pages (18-28) that describe Goals 1, 2 and 3; or, if you knew about them, how you could have possibly failed to realize that some of the claims you were making in the article were false! I’m really having trouble wrapping my head around this, so please, help me to understand. I’m still not clear from your response whether or not you knew your article contained false statements. Did you? If you knew, then it must be made clear that such lying isn’t OK; honesty is a sine qua non of decent journalism. Your intention may have been to counter the ‘spin’, but the appropriate way to respond to spin is with truth, not with lies and more spin. If you didn’t know, then I would suggest that, in the future, you focus more of your energies towards honestly and critically reporting on events, and less on trying to create in your audience the perceptions you wish them to have. I think good reporting often does foster dissent, but it does this almost as a side effect, by showing audiences important truths which are hidden from them. You do not decide what you want people to dissent to, and then try to come up with a narrative that will induce them to dissent to it. If you ask me, the manufacture of dissent is as reprehensible as the manufacture of consent, for largely the same reasons. As for your questions, they’re irrelevant to our discussion. I’m not here to defend or express an opinion about EBM, Greenpeace, or even the CBFA. I posted my comment here on the advice of The Dominion editors as a way to address the false statements contained in your article; my intention is to correct those errors, and to try to engage in a process that will help ensure that the material The Dominion publishes in the future is both accurate and honest. Not only do I think this is important for ethical reasons, but I also happen to like The Dominion quite a bit (been a member for over a year), and so I don’t like to see its credibility damaged. However, if you’d like to get to know me better and you’re ever in Toronto (or I'm ever in Vancouver), I’d happily take you out for a beer. Submitted by dawn on Sun, 2010-08-22 21:44. ASR your tone is disrespectful and your accusations against me are baseless. I interpret the CBFA as essentially about the amount of forest to be protected, as opposed to an agreement that is about how to save the caribou through things like EBM, green marketing, and supposedly combating climate change. Because my interpretation of the agreement is different from yours it does not mean that I am a liar or that I am making false statements. I don't have the time right now to go back through the agreement and rebut your arguments, as you will note that this piece was written months ago (just days after the agreement came out). As I stated before I am glad you read the agreement, and if you think it's a great deal, then that's fantastic for you. I'm more skeptical. I don't expect you to agree with me (not for one moment) but I do expect respectful dialogue. Until that happens, I consider this discussion closed. Submitted by Petr Cizek (not verified) on Mon, 2010-08-23 00:46. Hahaha, looks like a Pew/Gang Green operative finally had a look at your excellent article Dawn. The simple answer to the operative is that he/she refers to "aspirational" parts of the agreement. In contrast you point out that the only immediate and concrete things that the agreement does is get Gang Green to agree to support logging an area the size of PEI in woodland caribou habitat in exchange for deferring an area the size of the City of Toronto. Oh, and Gang Green also agree "gang" up with industry on anyone who dares criticize them.....I guess the anonymous operative is just fulfilling the terms of the agreement. Submitted by ASR on Mon, 2010-08-23 12:11. The whole agreement is aspirational. It's just words on paper. A written commitment to not log in certain areas for a certain period of time is aspirational until that commitment has been fulfilled (i.e. until the time period has elapsed with no violations of the commitment). Thus, for now, the deferrals are just as aspirational as Goal 2 and the rest of the agreement. Also, I'm not posting anonymously, and I don't appreciate your accusation Petr. I not an 'operative' and I'm expressing my honest opinion. You don't know me, or what I think, or where I come from. What does it say about us if we can't point out factual errors (let alone express a diversity of opinions!) without being subject to attempts to discredit us personally? This is supposed to be democratic participatory media, and I'm amazed that I'm being attacked for pointing out errors in the article. Let's all follow Dawn's lead in her last comment and try to be respectful of each other. Oh look, I'm being repressed! Submitted by dru on Mon, 2010-08-23 22:27. You moved pretty fast from calling someone a liar in public and anonymously (when I post as "DOJ", I think that's anonymous unless it's possible for the people I'm talking to to figure out who I am) to complaining about being attacked! There does seem to be a difference of opinion between you and Dawn about what is substantially agreed to in the agreement. Since you persist in leaving your request in the spiky sheath of a bunch of insults, I'm sure you can understand why the dialogue isn't progressing as you might have hoped, if indeed you were hoping. One quick question: are you, or have you recently been, an employee of any of the parties to the agreement? I noticed, also, that you did not answer Dawn's query to this effect. Submitted by ASR on Tue, 2010-08-24 08:18. You're right, I did move fast. Because I thought Dawn made a good point and I felt bad about some of what I'd said. But if there's a standard, I feel it should be applied to everyone equally. I'm sorry I'm so worked up about this... I haven't been speaking respectfully, and I need to fix that. And thank you for acknowledging that I am raising a real issue. Here is a much gentler overview of my concerns; . I think there are few issues here. One is how I think the article should have covered the deal. Let's postpone that. Another is the question of what was substantially gained by the agreement and how we determine this (i.e. what are the criteria for qualifying as substantial); and a related question which I want to raise is whether we should make use of more than one set of criteria for what counts as substantially gained in discussing the deal. These last two are the areas where I think I'm unclear, and might have a different perspective to offer. On the question of what was substantially gained in the deal, I'm not clear what criteria were used in the article. From what people have said my best guess is that substantial gains are parts of the deal which actually protect forest from logging completely. But if so then it's not clear to me why the deferrals qualify as a substantial gain while Goal 2 (commitment to establish network of protected areas) doesn't. On the last question, whether we should use more than one set of criteria for deciding what counts as substantial gain (or for evaluating anything, really), I would argue that we often should. I think there are at least two main reasons for this. One is that your audience may be using different criteria from you and not know it, and so may be greatly misled and not really understand you; but if you adopt more than one set of criteria then you can communicate more clearly with a wider range of people who might not share your criteria, and you're able to compare and contrast different standards (this helps to convince others to adopt your preferred criteria; and allows others to judge the relative merits of different criteria for themselves so they can decide which they wish to adopt, rather than having only one option). The other reason is that to interpret, understand and evaluate others' actions properly, we need to know the criteria they're using, otherwise their behaviour could seem bizarre; not to say that we shouldn't apply our own standards as well, but we need to apply their standards too; I think this is important in order to give people with different criteria a fair shake, so people can judge for themselves what's valid and what's invalid in their perspective, rather than not considering it all; this is useful for critical analysis, I think, since by understanding the internal logic of people and institutions we seek to criticize we can offer more insightful criticism. And since I think it's generally the case that we're communicating with and trying to understand other people who have a wide variety of different criteria from us, we should keep the possibility of different criteria in mind when communicating with or interpreting others. I think that in the context of the CBFA multiple sets of criteria for substantial gain should be used for both these reasons. As for the audience having different criteria, I'm a perfect example; I think that substantial gains can be had by changing how logging happens (i.e. selective logging vs clearcut), not just where logging happens (and I suspect many people think similarly), and though I don't really know much about EBM, it sounds good on paper (in the CBFA), and I feel I would have benefited more if the article had acknowledged that EBM was in the deal (adopting my set of criteria) and then proceeded to explain why EBM was green wash (adopting Dawn's criteria); that way I wouldn't have been misled, Dawn could have the chance to share her views on EBM, and I would have had the opportunity to consider another perspective and decide what I thought made sense for myself. As for trying to understand people with different criteria, I think this is relevant with the ENGOs. One of the things that totally baffled me when I first read the article was I couldn't conceive how the ENGOs would trade so much for so little; it was totally inconsistent with what they claimed they were trying to accomplish in the boreal, and made them appear totally irrational; I had many doubts. But then I read the CBFA, and I saw that the CBFA was far more consistent with the ENGOs stated aims than it appeared in the article. And so I think that by not adopting the criteria of the ENGOs at all it makes them appear highly irrational in a way that's very misleading. I think it would have made more sense to say what the ENGOs thought they were getting (adopt their criteria) and then criticize it for it green wash or whatever (adopting Dawn's perspective). As for how I think the article should have covered the deal... well, I just described some of the ways I think the article should have been different. I think those were my main concerns, other than the mistake about the expiry date, which I'd fix. Other than that it's mostly just my personal opinion: some of the points raised I thought were solid, while others not so much. Though if I were writing it I would include a summary of the whole deal, including each of the goals, including goals 4 and 5. I guess to summarize I have three points for clarification or response: I’m not clear on what the criteria for substantial gain were for the article such that goal 2 didn’t qualify; when audience’s criteria for substantial gain might differ it’s important to be explicit and contrast yours to what theirs might be; when evaluating the behaviour of others we need to consider their criteria as well as our own. The last thing I wanted to raise was the issue of when the agreement expires, as there's been no response to that yet. I hope this was more respectful; I didn't feel angry writing it. As for your question about my employment history... I have another question: why do you guys want to know so bad? what is the potential relevance of that? I just don't see why it's relevant. Submitted by dru on Thu, 2010-08-26 12:00. I'll give you credit for continuing to move fast. I think that what you've written most recently qualifies as a fair and useful comment, which adds to the article that it's commenting on. Bummer that people have to wade through a bunch of other stuff to get to it, but you've apologized, so, onward. "As for your question about my employment history... I have another question: why do you guys want to know so bad? what is the potential relevance of that? I just don't see why it's relevant." You may choose not to disclose that, but I think it's very much relevant. When people are paid money by institutions, and when they might want to be paid money again by institutions, they moderate their views. The concept is known as conflict of interest, and it's quite widely accepted. I think that it's telling that no one from Greenpeace or any of the other partners has been willing to defend the agreement against the public criticisms. Even you won't put your name to your comments as an individual. By contrast, Dawn has taken the time to read the agreement, and for very little pay, put forward -- with her full name attached -- a view that exposed her to the anonymous hatred of dozens of anonymous people who apparently hate criticism of Greenpeace et alia. To me, that speaks to the level of unaccountable and ultimately illegitimate power that has been built up in the environmental movement. Part of what fuels that power is salaries and the promise thereof. Another thing that fuels that power is the anonymous invective and passive aggressive behaviour that anyone who ventures public criticism can expect to be on the receiving end of. And I would venture to say that there is a connection between the two. That, in my view, is why it's relevant. Submitted by ASR on Mon, 2010-08-23 11:43. I apologize if I’ve been disrespectful. As I said before, I don’t like being misled, and my frustration and annoyance over that, and the degree to which I and others reading your article have been mislead, is seeping into what I write. Also, I don’t think my tone has been any more disrespectful than your tone in either your article or in your response to one of the comments above, and I guess I assumed that if you were comfortable with talking to or about others in that way, then you’d be comfortable with others talking to and about you similarly in response (i.e. if you could dish it you could take it)... However two wrongs don’t make a right, and I probably should have been more respectful with my wording; your point is taken; I’ll endeavor to be more respectful, and I think we should all try to be more respectful in how we express our criticisms and respond to others’. Since you didn’t deny what I was saying in your last comment, I assumed you were acknowledging that the errors I was pointing out were real, and so I responded based on that assumption. I’m sorry if that was presumptuous. You suggest that our disagreement is about interpretation, but I don’t think that’s true. I also don’t think my claims that some of the statements in your article are false were baseless: I provided a basis, with specific quotations and page references. The error I pointed out about when the agreement expires is not an error of interpretation; the CBFA is very explicit about when it expires, and what the CBFA says is different (it contradicts) what you said. And as for the other error about what the ENGOs got out of the deal, even if you interpret the CBFA on the narrowest grounds, and decide to report only those parts having to do with the amount of forest to be protected, then you would still have to report on Goal 2 (establishing a network of protected areas). So I’m unclear on why you didn’t. Also, as I said in my first comment, if you think that EBM and recovery plans are so worthless that they may as well not be in the deal, than you need to give some argument or explanation. If a union negotiates a 3-year contract and agrees to cuts in benefits and wages in exchange for an ESOP and a TTC travel allowance for a year, and you’re someone who thinks ESOPs are bad, and you report on the deal as the union giving up benefits and wage increases in exchange for a years’ travel allowance, then I don’t think you’re reporting accurately, and I think readers will be misled. I think the right way to report in that situation is to acknowledge that the union got the ESOP, since it’s something they see as a gain, and but then criticize ESOPs as being bad/harmful or whatever. Otherwise it just makes the union look crazy; and maybe they are, but not on the grounds that such an article would have its readers believe (the right way to report this leads readers to believe the union is crazy because they think ESOPs are worth a lot, while the wrong way leads readers to believe they’re crazy because they think a travel allowance is worth a lot). In an similar way, since ENGOs see EBM and recovery plans as wins and have openly supported them for a while, it makes them look crazy on specious grounds to not mention Goals 1 and 3. And I’m sorry for not bringing this up sooner. I wasn’t sufficiently motivated to put the effort into writing out my comments (I knew this would take some time, as I didn’t want to just make my claims without supporting argument and evidence) until your article was actually published in The Dominion and I saw its credibility being damaged. But given how seriously I think you’re article misrepresents the contents of the CBFA, I do think it’s important that you either rebut my arguments or acknowledge the errors I’ve pointed out. Also, I never said I thought CBFA was a great deal; in fact, I too have my criticisms of it, and one of the reasons I’m troubled by the errors in your piece is because I think they take attention away from other criticisms of the CBFA which I think should be made. Where did you learn all your passive-aggressive behaviour, ASR? Submitted by Petr Cizek (not verified) on Mon, 2010-08-23 13:09. .....was that in law school (Hello Larry?) or do they provide a special course in "media relations" and psychological voodoo in some Pew-run Gang Green training camp? Did they also train you to baffle with acronyms? What the hell is an "ESOP" anyway (Not that I care in the least)? Submitted by ASR on Tue, 2010-08-24 08:25. In case anyone who reads this is interested, an ESOP is an Employee Stock Ownership Program, where workers own stocks in the corporation that employs them. Submitted by Petr Cizek (not verified) on Tue, 2010-08-24 13:51. As Dawn's article and our maps/graphics point out, the claim that logging is "suspended" in an area twice the size of Germany is a complete fabrication. Any other aspects of the deal which concern the wish list of future "aspirations" (protected areas, EBM, blah, blah, blah)are completely irrelevant. And it's also completely irrelevant to Dawn's central argument whether or not she correctly interpreted the whole deal or only the deferrals as expiring in 2012.